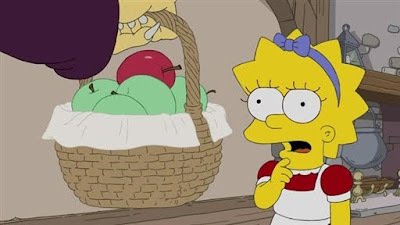 It just came to my attention that "The Simpsons" parodied the Disney version of Snow White this season (Season 20 episode 20). While I can only find a portion on YouTube to show you here, you should know they pretty much told the whole Snow White story in true Simpson's style with Lisa playing the main role of the princess. Interestingly, they didn't 'gorify' their version as much as expected, although their nods to other tales (Hansel & Gretel, Red Riding Hood and Goldilocks) were nicely done. It's not the first time The Simpson's writers have employed 'Disneyesque' fairy tale tropes in their scenes. Here's a scene from the movie where Marge and Homer get a little woodland creature help in the romance department. You can see the full Simpsons episode below or HERE on Hulu. Lisa Simpson's 'Snow White and the Seven' starts at 5 minutes, 5 seconds in. 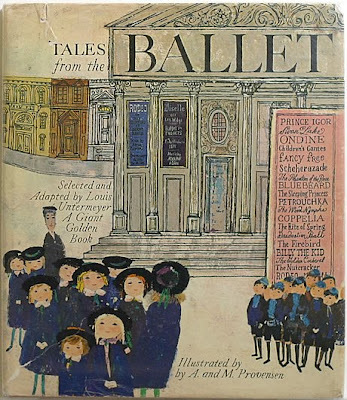 Provensen's "Tales from the Ballet"
From their book "Tales from the Ballet" (Golden Press 1968) by Caldecott Medal winners illustrators Alice and Martin Provensen*. As the title suggests, many of these tales are fairy tales. 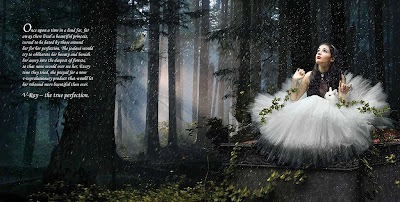 Either ballets were created from old tales like Sleeping Beauty and Ivanand the Firebird or new fairy tales like Giselle were written, often based on a little piece of something else (Giselle was based on a poem). 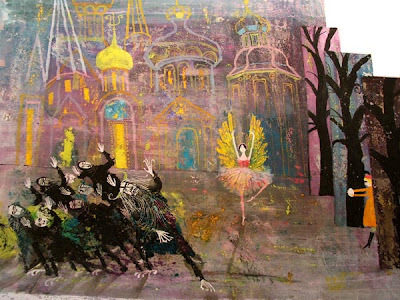 The Nutcracker, of course, is originally by E. T. A. Hoffman, truncated and adapted from his very long short story 'Nutcracker and the Mouse King' . 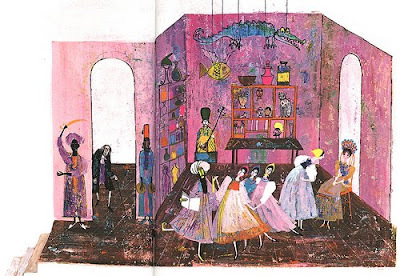 You can find more on the Provensen husband-and-wife author and illustration team* HERE and see the lovely Alice Provensen gallery HERE. 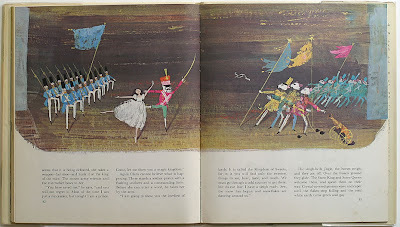 *The Provensen's are not credited with writing 'Tales from the Ballet' as well as illustrating it. The writer is listed as Louis Untermeyer. *The Provensen's didn't win the Caldecott for this book but for "A Glorious Flight", a biographical picture book about an aviator. *Some of these images were found on Flickr. The others were found on various foreign rare book seller sites. 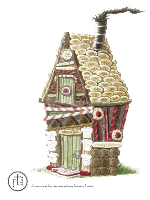 Today we are talking to Amy Morgan, creator of the Fairy Tale Factory. You can find out more about the factory and the exciting workshops Amy has going in our previous post HERE. This is a long interview post - but it's an interesting one, I promise! Fairy Tale News Hound: Hi Amy! Welcome to Once Upon A Blog... and thank you agreeing to this interview. AMY: Oh, gosh. I love fairy tales because they speak equally powerfully to my conscious and my subconscious. They remind me that the world is far more fluid than I generally suppose, and that people are more powerful than we generally allow ourselves to be. Fairy tales remind me to trust myself. And they're beautiful. I love them for that, too. FTNH: How have they influenced you personally? AMY: On a personal level, fairy tales have kept me going through many a dark and dreary time. Something about reading fairy tales and stories inspired by fairy tales gives me a tremendous sense of hope and comfort. On a professional level and as an artist, fairy tales have inspired some of my best work. That bit about trusting myself applies double-strength here - reading fairy tales has helped me trust my intuitions and inspirations. FTNH: What was/were your favorite fairy tale/s when you were younger? AMY: When I was a child I loved Rumplestiltskin. 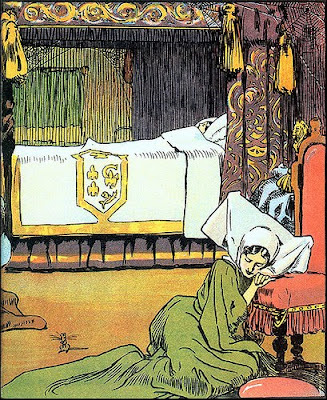 I had a collection illustrated by Tasha Tudor, and I was so fascinated by the fact that Rumplestiltskin [spoiler alert!] tore himself in two at the end. I would get my friends to act the story out with me - we'd use mustard-yellow yarn for the gold (this was the 70s - mustard-yellow yarn was plentiful) and we'd act out the whole thing. FTNH: What is/are your favorite tale/s (or types of tales) now and where are they from? AMY: My favorite tales now are the really long, weird ones from Italy and Germany. 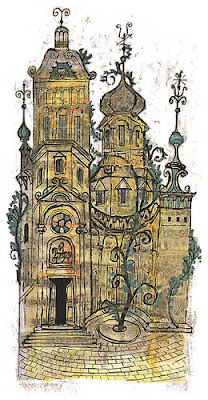 I've only recently started exploring the Russian tales, and then plan to move on to Chinese and Japanese. There's a Grimm story The Two Brothers in which two brothers get separated, and one of them ends up traveling with a menagerie. At some point in the story, the brother with the animals gets his head cut off, and the animals have to put it back on again. Okay, here comes my favorite part: they accidentally put his head on backwards! He notices pretty quickly - as one might, so they rip his head off again and stick back on the right way. Seriously. That is solid gold right there. The mishap with the head doesn't further the action of the plot in any discernible way. You don't learn anything about anyone's character from this little episode. It's just ... extra. A little gratuitous surrealism to help you on your way. Marie-Louise von Franz has actually written about this story and explains it in deep, meaningful, fascinating ways, but my enjoyment is more shallow than that. I just love how weird it is. 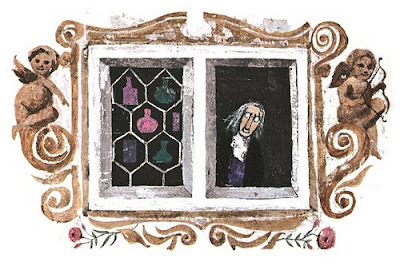 I also love The Juniper Tree - another violent, macabre Grimm tale. FTNH: Why do you think this changed? AMY: First reason: exposure. I only had that one collection of Tasha Tudor's Fairy Tales when I was a kid. I was so shocked and delighted when I discovered this whole other world of stories out there. Second reason: I'm a grown-up now. The little Amy and the grown-up Amy need different stories - we're dealing with different life challenges. FTNH: Why did you start the Fairy Tale Factory? 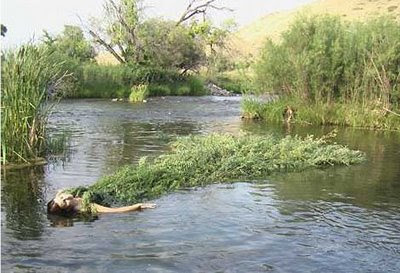 What prompted the idea? AMY: I was taking a sabbatical from work (aka - unemployed) and decided I was sick of the job market telling me what I could do for a living. I looked long and hard at the places where my passions intersected with my abilities, and decided that teaching a class about two of my favorite things (writing and fairy tales) could be a cool way to make money, meet interesting people, and justify my book allowance all at the same time. I also hope, in my more optimistic moments, that this class will give people some new tools to cope with hard times. I hope to inspire people, to encourage them to trust their own voices, and to help them connect with beauty in the world and in themselves. I especially want to help people find beauty in the parts of themselves that seem dark and scary. Like that Rilke quote about all our dragons really being princesses just waiting for us to be brave. FTNH: Who is the Fairy Tale Factory for? What sorts of people have expressed interest so far? What types of people do you think will benefit from attending the workshop/s? AMY: The Fairy Tale Factory is for anyone who needs it. All ages, all experience levels, all cultural backgrounds. If someone feels inspired to come to my class, I will do my best to help them express whatever it is they came to say. So far my students have been grown-ups with day jobs who still feel a connection to that playful, curious, magic part of themselves. They're intelligent, articulate, funny (so funny), clever, and stoked about the material. I really like my students. I think anyone who likes this kind of thing will benefit from the workshops. Professional writers get a great workout - you wouldn't believe what this format does for your writing. Novice writers get to stretch their wings and explore in a safe, supportive environment. And the subject matter is great for working through creative blocks, regardless of your experience level or even your preferred medium. I keep the classes small so that it's easier for me to meet students on whatever level is right for them. FTNH: So what was it about fairy tales that prompted you to use them as a teaching tool for writers? AMY: My own experience. Some friends and I were playing with the format and I was shocked at what a great workout it was. Plot, language, tone, structure - it's all there. It's easy for modern writers to be soft when it comes to structure - modernism and post-modernism, while awesome, make it hard to resist the temptation to write 500-page novels in which nothing happens but a lot of Clever Words. Fairy tales don't mess around. You know almost immediately whether your story succeeds, and there's no bluffing. It's kind of like reading your work to kids: You find out real quick whether those jokes are as funny as you thought they were. 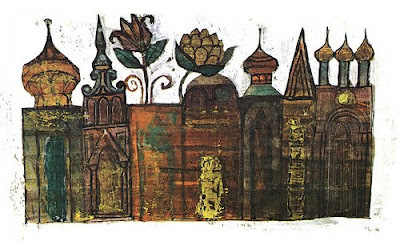 FTNH: I love the illustration for the Fairy Tale Factory homepage, complete with little iconic fairy tale symbols woven into the climbing rose border. Can you tell me about the illustration? How did it come about? Why did you choose two crows for the center? AMY: The homepage showcases the work of everyone on my insanely talented design team. 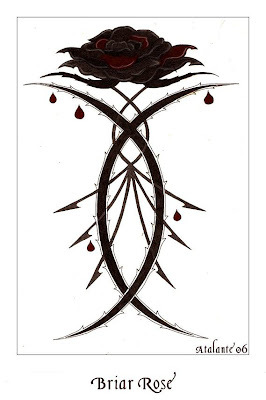 The crest is based on one that my designer (Angie Jernejcic) found in a book of heraldry. She designed the logo and it seemed like the best idea in the world to put it into that shield, flanked by those two crows. The crows chose themselves - all I did was say 'YES!' The climbing roses are from an illustration that Jeremy Eaton did for the site (he did all the illos). He drew each of the elements first (pumpkin coach, etc. ), then wove them into the border of roses. My web designer (Kelly Davis) turned it into a recurring motif - she took one little section and turned it into those gorgeous climbing ribbons as a sort of wallpaper. FTNH: There are quite a few retellings of fairy tales available and more being published all the time but not many original fairy tales. Putting aside the purist idea that true fairy tales are oral and collective in nature and can't be 'created' by one author, why is it that you're focused on creating new tales as opposed to retelling? Can you define the difference between retellings and creating new ones? AMY: I am so much more interested in what's going on inside people now than what's already been written. I think fairy tales are kissing cousins with dreams. It's an interesting an exercise to say, "Write Snow White, but in modern times in a Chicago housing project." (FTNH: eg. Donald Barthelme's "Snow White") But it's so much more compelling and personal to ask, "What image has been tickling the edges of your consciousness lately? What story is waiting for you to tell it?" Retelling is a good intellectual exercise. But it's easy to hide behind cleverness there. Ideally, writing your own personal tales will engage your emotions first, then your intellect. I think the stories have more juice that way. FTNH: Would you mind explaining how that's different from writing normal fantasy? AMY: What's different (and this is the technical workout part) is that you have to hold to the traditional fairy tale forms and conventions AND write a new story. This means that you are (a) groping around for the truest, most powerful and resonant images you can muster, and (b) coaxing those images into a form that is intensely limited. So you're engaging your subconscious and your conscious mind at the same time, like trying to stand on two boats at once. 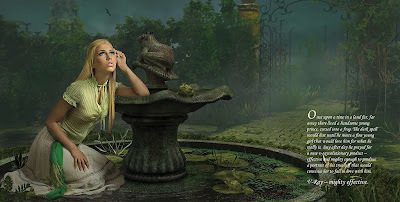 Modern fantasy is quite different, technically, from the traditional fairy tale. In the traditional form, there is very little character development, dialogue, or description. It's little more than a fleshed-out outline. So bare-bones word choice, sentence structure, and plot become your essential tools - that's all you have. There is a prologue in John Steinbeck's "Sweet Thursday", ... He says: "I like a lot of talk in a book and I don't like to have nobody tell me what the guy that's tlaking looks like. I want to figure out what he looks like from the way he talks... figure out what the guy's thinking from what he says. I like some description but not too much of that... Sometimes I want a book to break loose with a bunch of hooptedoodle... Spin up some pretty words maybe or sing a little song with language. That's nice. But I wish it was set aside so I don't have to read it. 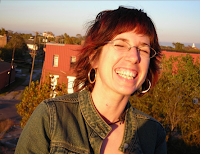 I don't want hooptedoodle to get mixed up with the story." My students laugh at me because I am obsessed with this concept: hooptedoodle. In my classes, I feel I have a holy mission to wean them off of hooptedoodle. At the last reading party I overhead some of my students shouting, "Hooptedoodle!" then laughing their heads off. I couldn't have been more proud. So that's the big difference between modern fiction and the fairy tale form that I teach: 85% less hooptedoodle! FTNH: How do the skills differ for each type of writing? How are they the same? AMY: For me as a writer, I'm doing something very different when I'm retelling a well-known story than I am when bringing out something new. In retelling, I'm in dialogue with my culture. For instance - Wicked uses our knowledge of the Wizard of Oz tale to explore cultural perspective. It's still a good story if you never read or saw Oz, but if you're saturated with Oz then you are a witness to the author riffing on all the ideas that Baum initially advanced and on all the things our culture has done with them between inception and present day. As an author, you can't help but do that when you are riffing on a classic. 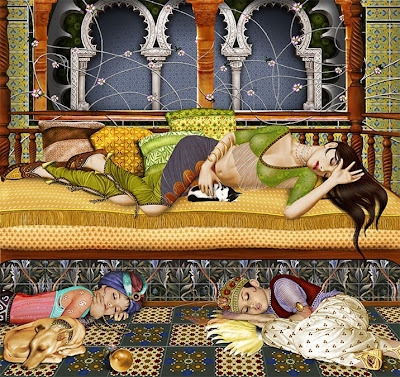 You start playing with feminist perspectives, like Jane Yolen's Snow White. Or any other perspectives, depending on who and where you are. The point is that you are using the warp and woof of the story's cultural context to further your storytelling aims. When you are writing an original, it's a much more internal, personal process. You're groping around and wrestling with images that are more slippery because they're unique to you. You can't build on the framework of what's already been done. You are making new characters and new plot devices, even if you're using the same old hero's journey structure that Homer and George Lucas and the ancient Sumerians did. You have to feel your way, asking at every juncture, "Is this it? Is this the best possible answer to the question, 'What happened next?' "
FTNH: Who are some of your favorite modern fairy tale writers? (either those who write retellings, originals or use fairy tales as a base for their stories) Any favorite fairy tale books you recommend (fiction or non-fiction)? AMY: Hm. I feel woefully Behind the Times - there are so many authors out there in this genre whose works I haven't read yet. That said, some of my favorites are Diana Wynne Jones, Charles DeLint, Patricia McKillip, and Neil Gaiman. I love young adult novels for some reason. Susan Cooper's The Dark Is Rising series is amazing. Garth Nix does some cool stuff in his Abhorsen books. 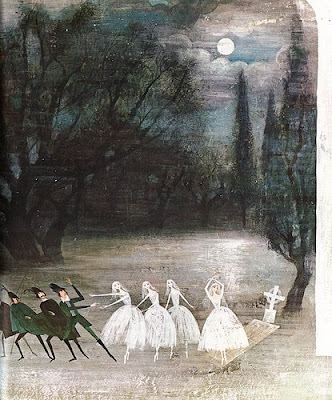 Non-fiction: I encourage everyone who's interested in fairy tales to read everything by Marie-Louise von Franz, who was one of Carl Jung's primary disciples. She's written scads of books about fairy tales and they are all great. Women Who Run with the Wolves is a great read, too - more Jungian perspective. I love the psychoanalytical treatments of fairy tales - am a total sucker for them. FTNH: You mention on the website that in the workshops you study fairy tales from around the world as well as the classic cannon. AMY: I'm not as inclusive as I'd like to be. I need more Latin American and more African tales. I am starting to get into Hawaiian stories, but only just. 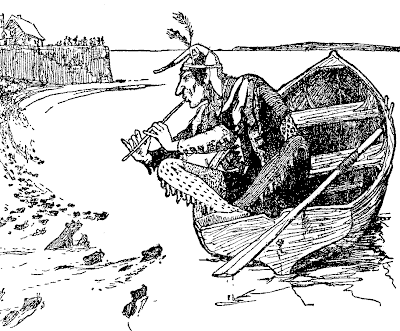 The main bulk of the stories I read in class are obscure European tales. I try to dig out the truly bizarre and exciting ones so my students can broaden their understanding of what fairy tales are and do. 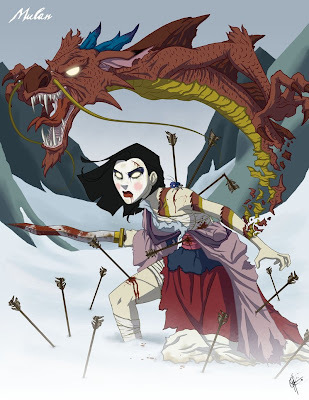 FTNH: You have a few original fairy tales available for us to read online. I personally love The Owl and the Maiden. Can we look forward to more? Do you have any plans for a collection/anthology and having them published? AMY: Thank you, that's so nice! I'm working on a new one right now, and will hopefully have it up on the site in the next month or so. I'm planning an anthology of all my students' stories from this past year and I might throw my own in there, too. I'm not hot and bothered to get published in any big way. If someone comes a-courting and wants to publish some of my stories, I'll definitely think about it. But I'm not chasing the dream of Making It Big Time as an author. FTNH: I'm hearing rumors of a 'reading party' for the workshop you held in June - can you tell me more about that? AMY: We do a reading after each class. It gives the students something real to write for. Nothing like the fear of reading your story out loud to a room full of strangers to sharpen your authorial edge! The readings are really fun. We drink a lot of wine and eat good food beforehand, so it ends up feeling more like a party than a reading. Students from different workshops show up to cheer each other on, friends and family come out. It's a nice way to wrap up the class. FTNH: It sounds like many people would enjoy and benefit from the workshops. Has anything about starting the Factory surprised you? 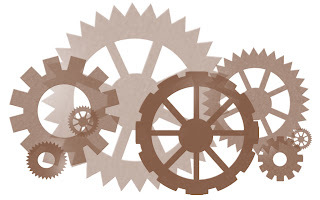 Do you have any stories/anecdotes you'd like to share from your experiences in running the workshops so far? AMY: The thing that's surprised me the most is how fun it's been. (Knock on wood.) I love my students, I love the material, and I love teaching - surprise! My crazy idea worked! That's the big shocker, the thing I'm still digesting: This wacky idea I had while sitting around in my back yard one summer is actually HAPPENING. And it's cool! That just blows my mind. I'm so grateful. The best stories, for me, are the actual stories that the students write. Those stories are way more interesting than any personal anecdotes. FTNH: What other plans do you have for the future of the Fairy Tale Factory? Anything online for those of us who can't travel to Seattle? AMY: If I could figure out a way to give online students the same depth of experience I can give them in person, I would do an online class. Sadly, I haven't worked it out yet. My classes are really interactive - I work hard to build strong group relationships, which seems to be an important part of the Factory's success. When I figure out how to do it online, I definitely will. I might build another module in which people can play with retellings and other, more modern tropes. Students would have to go through the Intro and the Intensive before they could do it, just to make sure we're all on the same page. But that's just an idea. A twinkle in my eye, as it were. I'm also scheming to get involved with the illustration community and have a heavy art component to the Factory. I'd love to have one illustrator assigned to each story in the annual anthology, then to have a group show to coincide with the book's release. 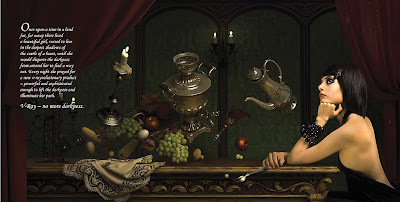 My dream is to work with artists like Jay Ryan, Milk, Julie West, Ray Caesar - pop surrealists, people coming from the graffiti world and the poster art world. FTNH: Thank you again for agreeing to this interview! 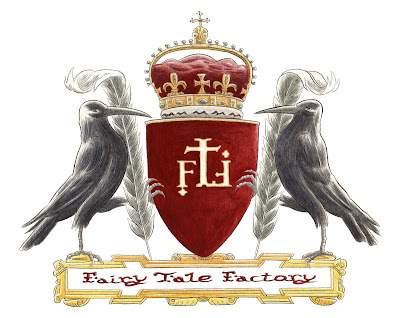 The Fairy Tale Factory sounds like a wonderful combination of education and fun and we look forward to seeing what you and your students do in the future. You can find out more about Amy, her Fairy Tale Factory and the workshops HERE. 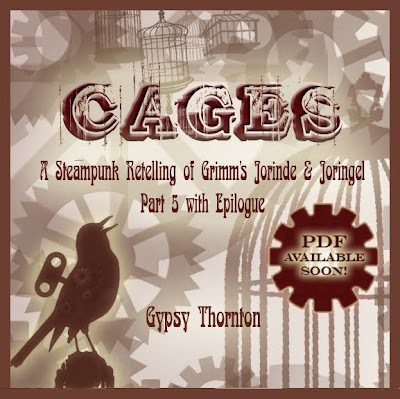 The final episode, 'Part V with Epilogue', of my steampunk fairy tale retelling is up at Supernatural Fairy Tales! There is a small button labeled PLAY below the header for the audio. There will also be a PDF of the whole story available for FREE download and distribution coming in the next few days, so watch for that (I will announce that here too). My husband Tom, for being my cheerleader, my extra eyes (and ears) on the story and for making sure I had chunks of uninterrupted time to focus on the work needed to get it all done. I couldn't have done it without your support. 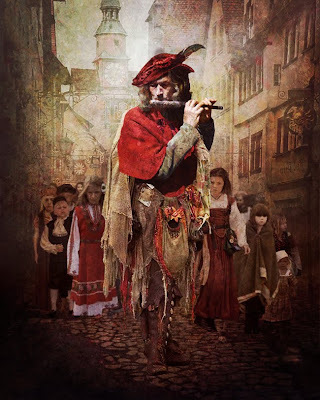 Hamelin still has need of a Pied Piper from time to time - the most recent being in December just last year. Officials in the town of Hamelin in northern Germany have expressed alarm at a surge in the rat population much like the Great Plague in 1284 on which the tale is based. “Rats usually come in packs of 20 to 30 but these can expand up to 200 or 300 and that what’s happened in Hamelin,” said Rolf Schmidt, who works for a pest control service in the town north of Hanover. The town, which has 58,000 inhabitants, has added teams of rat-catchers to try to contain the new plague. So what else about the tale is based in fact? "Among the various interpretations, reference to the colonization of East Europe starting from Low Germany is the most plausible one: The "Children of Hameln" would have been in those days citizens willing to emigrate being recruited by landowners to settle in Moravia, East Prussia, Pomerania or in the Teutonic Land. It is assumed that in past times all people of a town were referred to as "children of the town" or "town children" as is frequently done today. The "Legend of the children’s Exodus" was later connected to the "Legend of expelling the rats". This most certainly refers to the rat plagues being a great threat in the medieval milling town and the more or less successful professional rat catchers." You can read the rest of the theories and more about the tale HERE or read about the facts behind the fairy tale at "How Stuff Works" (which I recommend) HERE. 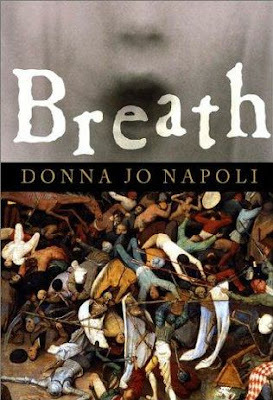 There are also a few novels based on The Pied Piper tale but my favorite, though chilling, is "Breath" by Donna Jo Napoli. Her well researched story puts a number of events happening in 1284 into a plausible story, giving the tale an even more sobering weight. While the book is YA, I recommend it to more mature readers as the subject matter is rather weighty in dealing with plagues, illness and the resulting societal chaos. A wonderful medieval book - complete with grit. (Regarding) the art project "States of Dress" by Robin Barcus Slonina. 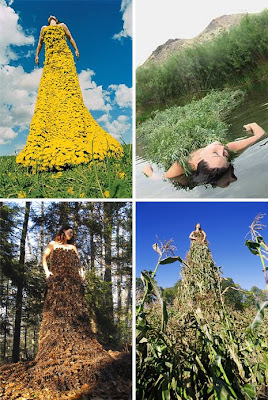 Barcus-Slonina is an installation and performance artist creating a site-specific, interactive "dress" sculpture in each of the fifty states in the USA. 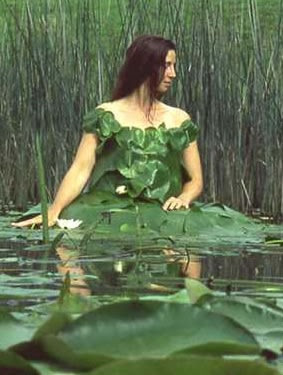 From what I understand, Ms. Barcus-Slonina took/takes 'found objects' and created a dress-form that was 'worn' (I use the term loosely, for these are not the sorts of outfits you can easily put on and take off), photographed then displayed in an exhibition she had. You can see some examples in this post. For me, these photos remind me not only of Ophelia with her flowers and her tragic drowning but also of many Russian myths and tales. 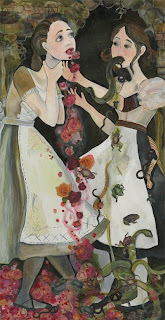 I can't find anywhere that Ms. Barcus-Slonina feels her work is influenced by there's no doubt there's a fairy tale feel about many of these creations. Here's a lovely film of her process (please note, it begins with her road trip to the state - Wyoming - in which this dress was made and the actual creation begins a few minutes in). You can find out more about her work in her blog HERE and see more of the 'ongoing traveling sculpture project' on her website HERE. New Ebook from Heidi Anne Heiner of SurLaLune: "Frog Prince and Other Frog Tales From Around the World"
Heidi Anne Heiner, long-time fairy tale advocate/ambassador and the genius (and incredibly tireless worker) behind-the-scenes of one of the best fairy tale resources on the web - SurLaLune - has been busy working on a new series of books and just released her first one on August 19th. 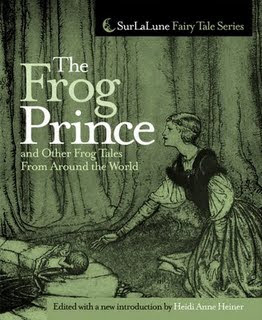 In perfect timing with the current buzz about princes masquerading as amphibians (thanks to Disney's upcoming animated feature "The Princess and the Frog" in December), this volume is titled: "The Frog Prince and Other Frog Tales From Around the World". This is super exciting, as the tales in these collections can't be found - either put together or the complete texts of such - anywhere else on the web! You can find the rest of the entry discussing publishing options, upcoming installments and the wonderful work her graphic artist husband did with the covers HERE. Please go support Heidi's amazing work, both with SurLaLune and these wonderful new series. 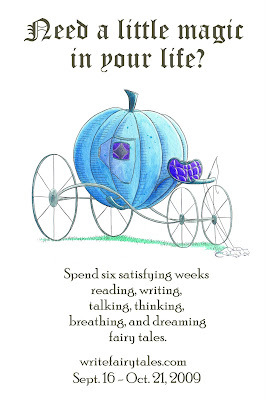 Her blog (also focusing on fairy tales) is HERE, the website (very possibly my favorite on the web) is HERE and you can buy some wonderful products HERE (at CafePress) and HERE (at Zazzle), all of which help pay for the running costs of the site, which we sincerely need to stay active and available! A FROG with a crown on its head. A girl kissing a frog. If you pay attention, you’ll notice the images appear frequently in the world around you. These and other variations — many humorous — appear on t-shirts, in advertisements, on book covers and novelty items to name just a few. Their shorthand message: You have to kiss a lot of frogs to meet your prince. Just about anyone will tell you it’s from a fairy tale, some may be able to tell you the story. Not many people know that the familiar story isn’t really an old tale but a fairly new variation of several tales that have been circulating for centuries. ‘And so the princess kissed the frog, turning him into a prince before her very eyes.’ A frog transformed into a prince with a kiss. That’s how “The Frog Prince” fairy tale ends in modern popular culture, but it’s not the way our ancestors knew the tale. Most often, violence was the key to ending the enchantment in the earliest known versions traced back to Scotland and Germany. The Scottish tale is most familiarly known as “The Well of the World’s End” and first appeared in print in The Complaynt of Scotland in 1549, predating Shakespeare. 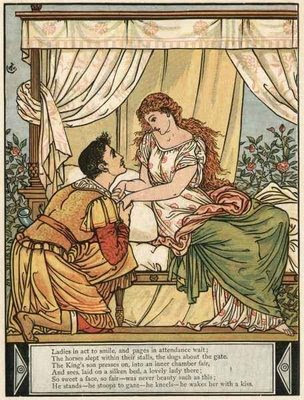 The title is romantic, but not nearly as easy to remember as our more familiar “The Frog Prince.” The tale is considerably different, but obviously related to the tale of today. 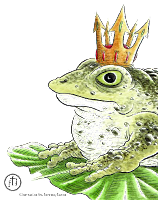 You can also find a whole set of pages at SurLaLune dedicated to the tale of The Frog King, or Iron Henry (also known as The Frog Prince) HERE. From us all, Heidi, thank you from the bottom of our hearts for all your work with and for fairy tales. We're very lucky to have you on the fairy tale team! 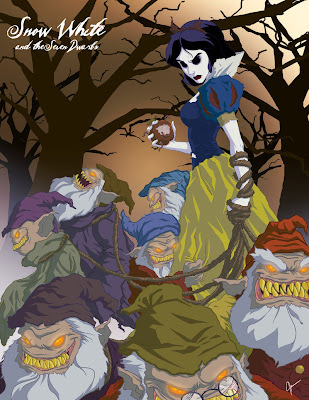 Want to see what the Disney Princesses would be like if they went to the dark side? Jeffrey Thomas (aka *jefftoon01 on deviantART) has done a wonderful job of exploring exactly that and has a very cool series going in his gallery. 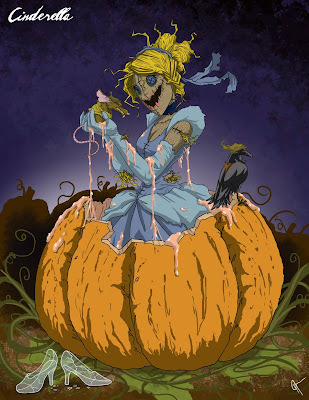 If you appreciate dark fairy tales you'll love it, not to mention vampires, zombies and other monsters we love. I recommend clicking on 'full view' as there are a LOT of cool details and story nuances you won't see in the thumbnail versions. Here's a few examples - no passive princesses here! (Um - wow! I do NOT want to meet this Aurora in the woods!) 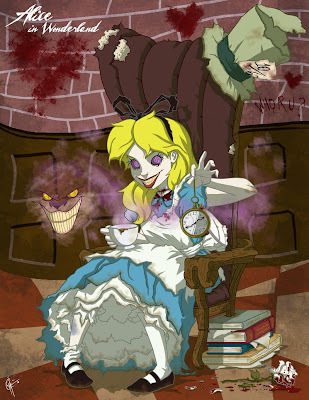 (The Cheshire Cat here is exactly how I envision him!) Yay for fan art! You can find the rest HERE in his deviantART gallery. "Awesome stuff Jeff! More please!" NOTE: A sincere thank you to Bryan Prindiville for alerting me to these! He's a fabulous cartoonist/illustrator himself - go check out his WEBSITE and enjoy - a lot of things to make you smile there. I admit it: I'd heard about the book but never ventured further in my investigations - I should have. "Who Killed Amanda Palmer" by Neil Gaiman, has a retelling of Diamonds and Toads as part of the text. This is one of those fairy tales I came to know as a child and so didn't realize it wasn't well known till much later. It's one of those tales that has many (MANY!) variants in many countries and is begging to be explored. In the Western world it's also known by the titles: Mother Holle (or Frau Holle) and The Fairies. SurLaLune - the best fairy tale resource on the web for text, annotations and interpretations - has a page on the VARIANTS around the world and the list is very long. Clearly, this is one of those stories that resonates across time and culture very well. One of the short stories that has stayed with me is a retelling of this very tale and can be found in "Twice Upon a Time", edited by Denise Little. The title is "How I Came To Marry A Herpetologist" by Nina Kiriki Hoffman and turns the usually perceived curse of speaking toads and snakes on its head. To this day, I'm on the fence about whether I'd choose to speak jewels or reptiles as a result. Thanks to the community at Told This Time for alerting me. I couldn't help but expand on this news and add a little extra information about the tale for those curious. You can see the original post HERE. NOTE: The illustration is by Lealand Eve, who has other illustrations exploring 'discomfort in fairy tales'. This tale definitely qualifies. You can find out more about Lealand Eve and see more work HERE. Discovered on deviantART, this 'V-Ray Tales' series is advertising the power of the V-Ray rendering engine for 3D computer graphics but I think these images (not including the accompanying text) show us yet another interpretation of our old favorites. The artist is Silvia Bratanova (SOOO on deviantART) and is an 'experimental photographer/designer', working as part of 'Wings Creative Studio' team. There is text on each image with the 'tale' (according to V-Ray). Clicking on the images will take you to Silvia's deviantART page where you can click 'Full View' and have a closer look to read what's written (there's an example at the bottom of this post). Once upon a time, in a land far, far away, there lived a beautiful princess, cursed in a most peculiar way - whenever she saw a bad pixel, it would turn into a pea underneath her mattress. She would lie awake every night praying for a new v-rayvolutionary product - reliable and accurate enough to render out all the pixels and break the curse. V-Ray - no more sleepless nights! Kate Wolford of Diamonds & Toads and associates are working on creating an online fairy tale magazine! The magazine will be titled "Enchanted Conversation" with the first issue planned for early 2010. Each issue will be themed and the first theme is - you guessed it - 'Sleeping Beauty'. The magazine will be aimed at people interested in fairy tales (from studies and analysis through to general enjoyment) but it won't have an academic 'tone', the aim being that it's accessible to, and enjoyable for, anyone. Think fun - and enchanting - with substance! Submissions of fiction, poetry, articles and art are now open to anyone over 18 but, as with all professional publications, please be sure to read the guidelines before submitting any work. Please note that an editor will have final say of any accepted pieces and there is no guarantee of publication for submissions. Submissions close November 15th, 2009 or whenever the Editors have enough quality content for the issue. You can find information on what the desired submissions are HERE on the right of the page and submission guidelines HERE, and don't forget to check out the submission tips! While the magazine home site is still very much under construction, work has already begun on the first issue and submissions are encouraged. Please visit www.enchantedconversation.net for more information. The key to making this online magazine work is exposure (i.e., lots of readers!) along with excellent content that 'enchants' readers so they come back for more, so start spreading the word! I'll let you know of any updates through Once Upon A Blog. I'm very much looking forward to the 1st issue! Please note: there's both an interview AND an excerpt so this post is a little longer than usual for this blog. Don't worry - it's not the new standard! In the past week we've been having a look at the short stories written and entered in the Diamonds & Toads "Great 'Sleeping Beauty' Rewrite" contest. Today, I'm happy to present the winning author, Tahlia Merrill, in a brief interview and show you an excerpt from her winning story, "The Prince With Good Manners". Her charming retelling, "The Prince With Good Manners," won for the following reasons: It had a completeness to it that showed a good management of the 1,000-word limit. It was very much a retelling, with a sense of newness to it. Tahlia's story also featured a non-passive princess. Most of all, her story found a very clever way to have the princess and prince get to know one anotherbefore she woke up. 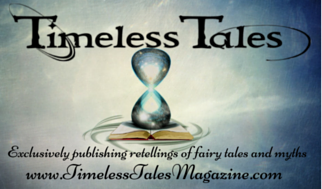 Tahlia was kind enough to agree to a quick interview withe the fairy tale news hound for Once Upon A Blog, about her story and her love of fairy tales. Fairy Tale News Hound: First of all, a well deserved congratulations on winning the contest! Tahlia: what an appropriate name to win a 'Sleeping Beauty' contest with! Tahlia: Would you believe that I found out after the contest about that rather uncanny coincidence? I've read a lot of early versions of fairy tales, but somehow that one slipped through the cracks! I have a pretty uncommon name and I thought I knew all the cultural appearances of it in literature, but I definitely missed that one! 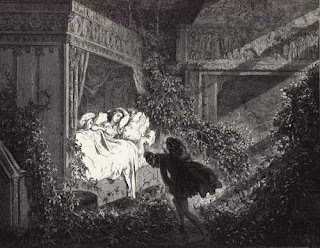 FTNH: What do you think of the first written version of 'Sleeping Beauty' in The Pentamerone (Sun, Moon & Talia)? Tahlia: Well, it's not really a surprise that it's nothing like the Disney version, but it's amazing to see how drastically the entire spirit of the story has changed over time. When I read it for the first time, it actually reminded me a lot of a Greek myth, because it has the same crazy soap opera drama feel to it. 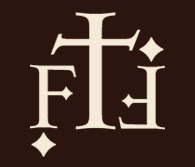 FTNH: Diamonds & Toads posted a small bio for you so instead of repeating that information I thought I'd ask you some questions about your story and your enjoyment of fairy tales in general. What is your favorite fairy tale and why? 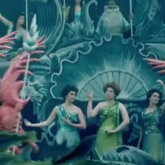 Tahlia: Probably the original Hans Christian Anderson version of "The Little Mermaid". It was the version that I was brought up on--we had a beautiful picture book version of that used dolls in the photographs. I also listened to it on a record over and over again when I was little. It's like an Andrew Lloyd Webber song--it grabs your emotions and connects you to the story in a way that many fairy tales fail to do. The image that always sticks in my mind is the little mermaid's new legs allow her to walk and dance with grace, but every step feels like she's walking on knives. It's that push and pull of wanting the thing that will hurt you that fascinates me every time I read it. FTNH: What are some of your favorite fairy tale retellings and why do they appeal to you? Tahlia: I will admit to being a sucker for Cinderella retellings. Ella Enchanted by Gail Carson Levine was the first retelling that I read for the first time and just thought, "Whoah!". I've read that book half a dozen times because it doesn't just retell the story, but it takes it to a whole new level that I never knew fairy tales could reach. Her Princess Tales series is also delightful. Just Ella by Margaret Peterson Haddix is a slightly grittier version of Cinderella that I appreciate because of the daring twist it takes at the end. Vivian Vande Velde's The Rumpelstiltskin Problem is what initially inspired me to write my own fairy tale retelling because she puts SIX radically different spins on the story into one book. That's the book that got me starting to think about all the practical problems that classic fairy tales seem to overlook. FTNH: What made you decide to give Deidre a 'voice' prior to being woken up? Tahlia: Well, I started thinking about how awkward it would be to wake up to some random guy you've never met kissing you! That was my initial thought, and then I started wondering if there could be any way for the sleeping princess and the prince to actually get to know each other before the kiss. So I came up with a way to let them communicate and fall in love so that when they kissed, it actually meant something to them. Many fairy tale retellings are all about trying to break the damsel in distress stereotype, but I wanted to focus more on the prince and his feelings about the whole situation because he's the one who ultimately has to break the spell! Once I started running dialogue in my head between the two characters, everything else just fell into place. FTNH: What did you learn/receive from the experience of retelling a fairy tale, especially one that had to include certain elements (besides the lovely prize, of course)? Tahlia: For me, I have spent most of my writing years working on manuscripts for novels that I hope to publish someday, so it was extremely hard to keep this story under 1000 words. It was originally 7000 words, with a much fuller plot arc and character development. I had to save that copy and then cut out the first 3/4 of the plot and start the story there. So I learned the invaluable lesson of how to mercilessly cut down a story while still preserving the spirit of it. Thinking about creative ways to twist Sleeping Beauty has also given me lots of new ideas for more fairy tale related stories. One unexpected gift that this contest has given me is a large spike in visitors to my website (guardianghost.wordpress.com) that features the current writing project I'm creating with my friend. I've never been published or won any writing contests before, so it's really helped me feel more confident as a writer and gives my parents some hope that I might not have to be the starving artist type. FTNH: If you had been in an enchanted sleep for one hundred years what sort of breakfast would you order on waking up? Tahlia: All perfect food is made by my mom, so that would be my first of my criteria. I think I'd want a berry smoothie with bacon and cheese quiche, some raspberry tarts, and LOTS of homemade doughnuts. Oh, and pancakes! And poptarts! And just the marshmallows of Lucky Charms! Gosh, I hope my prince has a good appetite, because there's no way I'm going to be able to eat all of my first breakfast without some help! Thank you so much for chatting with the Fairy Tale News Hound today! We wish you every success in your studies and your writing. You can find out more about Tahlia HERE at Diamonds & Toads on the August 6th entry. “This is the last quest I am ever going on,” Patrick muttered to himself. He struggled up the never-ending staircase, sweat weighing down his tunic. At the top, a door was finally in sight. Before he could reach it, his brother Prince Conrad burst out of it and rushed passed him, muttering to himself, “…didn’t work…bad omen…voices of ghouls…” Before Patrick could say a word, Conrad was gone. “Well, I’m not giving up now that I’m here!” Patrick called to the sound of retreating footsteps. Plodding behind Conrad for hours chasing this legend had been bad enough. For Patrick, there was no turning back. Moving closer, he could read a stone plaque on the door. “Here sleeps Princess Deirdre of Acrasia, until after a hundred years have passed from the twelfth day of Yune, 988. Whence that time arrives, she shall be awakened by a kiss, and the rule of the royal family shall continue. Patrick spun in a full circle, frantically searching for the speaker. Confused, and a little frightened, Patrick crept over to the bed. The princess talking must not be asleep after all, maybe she was just pretending. There she was, lying on top of the covers. Her breathing was deep and relaxed. She certainly looked like she was sleeping. Patrick swallowed hard and tried to remember his manners. 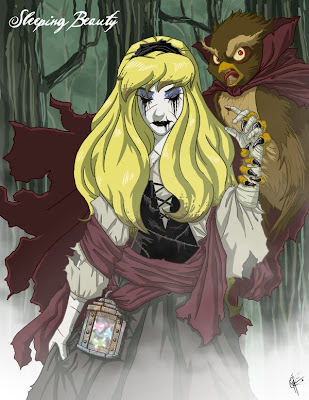 Here are some more interesting interpretations of Sleeping Beauty. Click on the covers for more information on each. You can find even more HERE at SurLaLune. NOTE: The illustration at the head is by Ivy Izzard. You can get a closer view and see more of her work by clicking on the image or HERE. The black and white illustration is by the legendary Gustave Doré. Click on the image or HERE to be taken to more information about him. Charles Vess Illustrating Gaiman's "Instructions"
Animation Test for "The Princess and the Frog"